Claire Butin, 98, longtime resident of Monroe, retired from teaching physics and other sciences at Monroe High School in 1983. But before he became an educator and mentor to students, he served in the U.S. Army Air Corps before and during World War II. 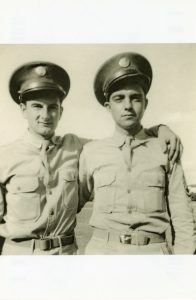 Brothers Carroll (left) and Claire (right) Butin enlisted in the U.S. Army Air Corps in 1939 and went through basic training and served together as teletype operators at Randolph Field in San Antonio, TX. So, the Butin brothers enlisted in the U.S. Army Air Corps in 1939 and went through basic training and served together as teletype operators at Randolph Field in San Antonio, TX. But then Claire was sent to Chanute Air Force Base in Rantoul, IL, where he served as an instructor of Morse Code and also received additional training. Butin’s training focused on the operation of link trainers, which were one-person flight simulators used to teach pilots how to fly by using only their instruments, a technique known as IFR (Instrument Flight Rules), as opposed to VFR (Visual Flight Rules). IFR allowed pilots to fly more safely in darkness, through clouds, and in adverse weather conditions. The link trainer was also known as the “Blue Box” and responded to the movements of the simulator chosen by the pilot, providing corresponding readings on the instrument panel in the simulator’s cockpit. 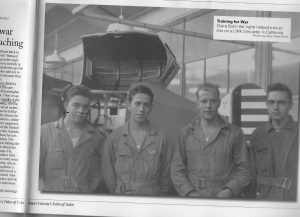 Claire Butin, on the far right, in a picture published in Jasper County’s “Tales of Valor” book, which honors veterans and their WWII experiences. But as busy as he was, Butin’s thoughts would frequently go back to Iowa. On one of his early military leaves, he went back to Jasper County to visit. 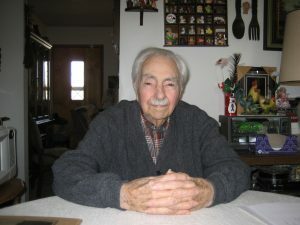 “This was always home,” Butin recalled. He’d heard of a community orchestra event being held in Sully, and he decided to participate by playing the violin, a hobby he enjoyed. 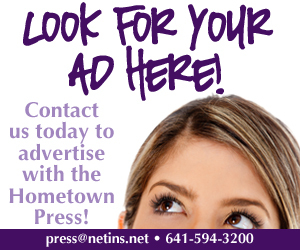 A friend of his at the event said there was someone he wanted Butin to meet, and it was there he met Bernice (Bernie) Renaud, a high school senior in Sully who was serving popcorn that day. Bernie must have made quite an impression because some time after graduation and having become employed at the creamery in Sully, she received an envelope in the mail from Butin, by then stationed in California, which contained an engagement and wedding ring. So, yes, she accepted, and the two married in September 1941 in the home of Bernie’s mother while Butin was on a 10-day leave, and then the couple went together to Sacramento to start their life together. Claire Butin at Randolph Field in San Antonio, TX, in 1939. However, in just three short months, life changed dramatically again for the newlyweds. In the Sunday morning hours of Dec. 7, 1941, the Butins learned about the bombing of Pearl Harbor in the Pacific. They often spent Sundays with another couple with whom they were good friends on the base, and that day they ate lunch together and went to a movie in town. However, as the large crowd of moviegoers was leaving the theater, all military personnel were told to report back to base immediately. Because Sacramento was the capital city of California, the largest state on the U.S. west coast, and because of its military presence, “there was a lot of fear that we might get hit next,” Butin explained. Nobody knew whether or not the mainland was being considered an enemy target, nor if or when a strike would happen. But in order to be prepared for the possibility, Butin and others spent the night guarding the buildings and equipment on base, and the two Army wives stayed together as well ­– a very scary night for everyone. Claire Butin’s uniform jacket hangs on a chair in his Monroe home. 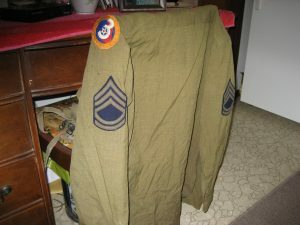 The sleeve of the uniform is emblazoned with Tech Sergeant stripes and the patch on the shoulder includes the U.S. Army Air Corps insignia. When the U.S. entered World War II after the Pearl Harbor bombing, it became even more important for U.S. pilots to be trained using the link simulators and become adept at IFR. Butin was sent to Denver, CO, Victorville, CA, and Augusta, GA, for additional training in bombsight repair. He and Bernie finally settled in Tampa, FL, where he spent the last three years of his time in the military, dedicated to the operation of additional link trainers there. 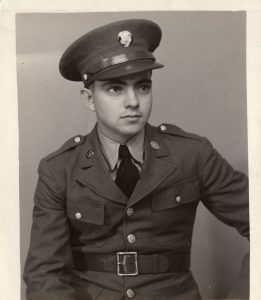 Having achieved the rank of tech sergeant, Butin was discharged late in 1945 after six years in the service and returned to Iowa to further his education in the field of science. He studied at Central College and Drake University, and taught high school science first at Cedar and then at Monroe where he was well known for being the physics teacher and coordinator of several science fairs. He also served as principal of Monroe High School for a time. Claire today at his home in Monroe.